Shweta Dewan (Bosnian Family – BOSFAM): Shweta was born and brought up in Zambia. This has greatly influenced her outlook on development and her understanding of society. After completing her BA in government from the University of Texas at Austin, Shweta returned home to Zambia to work with the United Nations High Commissioner for Refugees. She went on to work with the USAID-funded American Institutes for Research, where she gained practical experience implementing microfinance projects for widows and young school girls. She later worked at United Nations Children’s Fund in Zambia. At the time of her fellowship she was a graduate student at Columbia University pursuing a dual-degree in international affairs and public health. 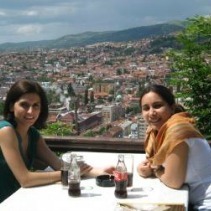 After her fellowship, Shweta wrote: "I feel that so many people still do not know about the magnitude of what happened in Bosnia and the effects that still make the lives of so many in Bosnia so difficult. There are still many eyes to be opened – something the Advocacy Project has learnt how to do well, and so yes, I do feel that there is a message that needs to be made heard, and supported, with AP’s help." I am back in Zambia and my whole Bosnian trip seems like a distant dream.